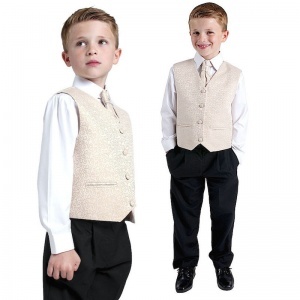 Boys champagne 4 piece waistcoat suit for baby boys, toddler or older boys. 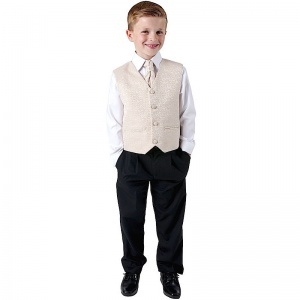 The perfect suit for boys in the wedding party. Waistcoat: Champagne gold swirl pattern, fully lined, double pockets, 3 clear centre buttons, plain back, adjustable strap/buckle on back for perfect fit. Cravat: Matching champagne gold swirl pattern cravat, diamante to the centre, velcro fastening at the back, complimenting the suit perfectly. 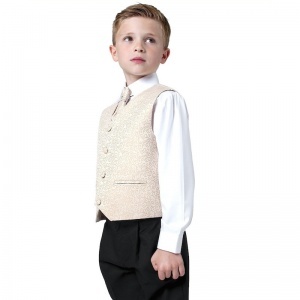 This boys wedding suit in champagne will make him look like the perfect handsome gentleman. The perfect suit to co-ordinate with the ushers and groom.